I've developed my first, production program for netduino 2, updated with 4.3.1 firmware using 4.3 QFE2 MF SDK. Very flawless experience, I could get it done in a workday! My program is a digital I/O remoter: I'll connect netduino 2 to a Panel PC's RS232 (using netduino COM4, to not eat two digital I/O) and I'll read and write I/O from the panel PC, using a simple and documented protocol I've created (in the same workday). All is managed with interrupts and spontaneous sends on RS232 so that from the panel pc software I don't have to poll for input pin changes. This is working VERY NICELY, and I'm astonished I could do it in a workday! using Visual Studio I can deploy without problems, press F5 and there we are. Now I have to pass the software to our company people that will prepare 20 netduino2 for a customer, so I was guessing to use MFDeploy for that. I've correctly created the .hex file so to pass the hex file to the people who will prepare the boards, they'll have only to deploy the .hex file to the 20 netduino2. But I cannoy get MFDeploy to deploy anything! I correctly see netduino, I can ping it (reply is from TinyCLR) but pressing the Deploy button an error stating "Error: No response from device" is shown. EDIT 2: Searching and searching anywhere about it I've found an old Chris reply about ignoring signature chack failing, unplug and replug the device that it should work ok. I did it and... that's true! If you have 4.3.1 firmware on the N2 and 4.3.x SDK installed MFDeploy will not work. 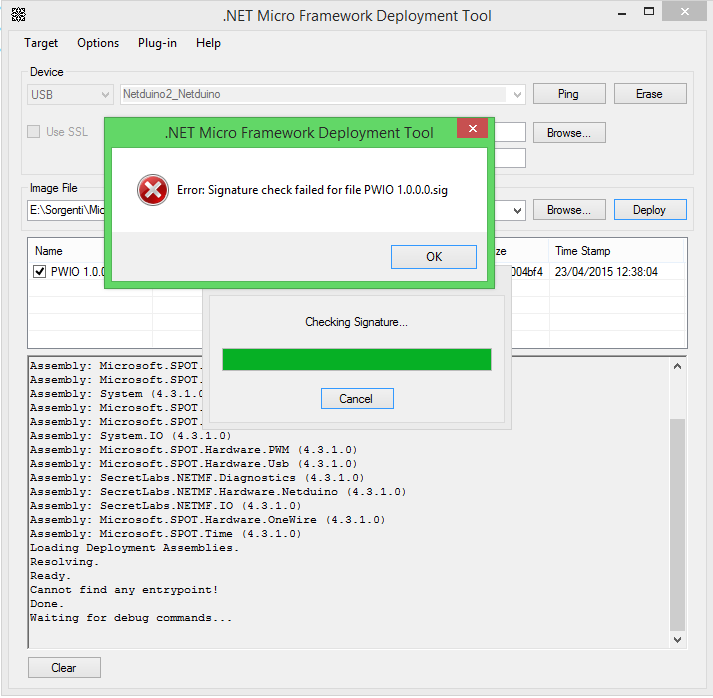 You have to install MFDeploy from 4.2 SDK (personally I've installed the old SDK on a colleague PC to not mess my SDK and copied only the folder C:\Program Files (x86)\Microsoft .NET Micro Framework\v4.2\Tools (C:\Program Files\Microsoft .NET Micro Framework\v4.2\Tools on 32bit machines) from the PC where I've installed the 4.2 SDK to mine. You'll find that folder as already existant, that's ok but don't overwrite existing files. Now you have MFDeploy 4.3 in the 4.3\Tools folder and MFDeploy 4.2 in the 4.2\Tools folder. Use 4.2 MFDeploy to create and deploy the .hex file and when it's complaining about .sig file just ignore the message, in reality all was correctly done. Just unplug the device (to turn it off) and replug it. Your program will start. Are you using MFDeploy from the 4.3.1 SDK? If so, you may want to grab a copy of MFDeploy from the 4.2 SDK and try deploying with that. I know it sounds odd...but there are some timing changes in the new SDK which could potentially cause issues like this. Also...if you connect to device using F5 from MFDeploy first, does that help it deploy? Welcome to the Netduino community, and thanks for sharing your experiences with us! I've tried recreating the hex file with MFDeploy 4.2 with and without the key file: very same result.